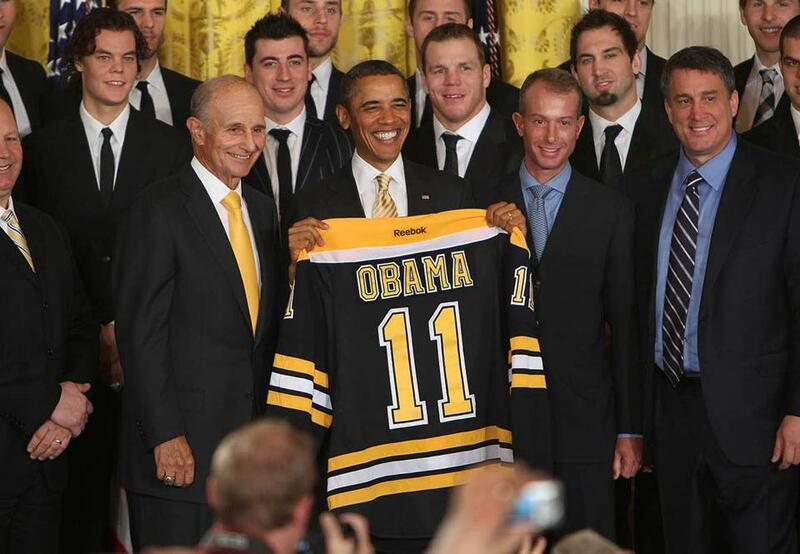 When the Bruins visited the White House in January 2012, one high-profile member of the team was absent. Picked-up pieces while reminding you that the Yankees would have signed Nathan Eovaldi if George Steinbrenner were still alive . . .
■ Seriously, I’m all-in on the Red Sox signing Eovaldi. I haven’t been this sure about a Sox acquisition since they beat everyone to the punch and bagged Pablo Sandoval after the 2014 World Series. The Sox will pay more than $84 million to their top four starters next year. It’s a serious commitment to winning now. ■ The Red Sox are going to the White House sometime in February, March, or April. This wasn’t such a big deal back in 1984 when the Celtics went to visit with Ronald Reagan a few hours after winning their 15th NBA championship on a hot weeknight at the Garden against the Lakers. When Larry Bird, Robert Parish, and Cedric Maxwell failed to make it to Logan in time for the flight to D.C., we just figured they were sleeping, or hungover, or both. It was not a political statement (Max now tells me he was at City Hall applying for a marriage license). Point is, it was no big deal. Remember George W. Bush noting that Manny Ramirez was absent because “his grandmother died again” after the Sox won in 2007? Everything changed when Tim Thomas put the tinfoil on his head and released anti-government screeds while his Bruins teammates were traveling to Washington after winning the Stanley Cup in 2011. Now everything is a political message. Theo Epstein made sure his 2016 championship Cubs got to Washington before the Trump folks moved into the White House in January of 2017. In 2018, we have The Great Divider still smarting from team snubs by the Golden State Warriors and Philadelphia Eagles. That’s why the Sox announcement this week was kind of a big deal. The Sox played it cool after winning in October. Ditto for the Trump Administration. The administration was careful not to issue an invitation until it knew there would be acceptance, and the Sox said little while they waited for the invite. Clearly, Puerto Rico native Alex Cora is not a fan of Trump. But anyone who believes the Sox clubhouse is united against the president would be surprised to learn the dynamics of the modern baseball locker room. There are not a lot of African-American big leaguers. There are a lot of Republicans and devout gun owners. The best play here is to respect the office, make the trip, and get it over with. Just wondering what number jersey the Sox will give Trump. No. 45 was retired by Pedro Martinez. Red Sox jersey No. 1 is also taken (Bobby Doerr). Number zero is available, but some folks might take that the wrong way. ■ Speaking of presidents and baseball, Hall of Famer Jim Palmer tells me that Reagan still had his fastball when Palmer went to the White House for a baseball celebration in 1983. “I caught his ceremonial pitch and he was throwing 80-85,’’ recalled Palmer. ■ If I’m Bob Kraft, I’m ordering Josh McDaniels to squash all these head coaching rumors. The Patriots paid McDaniels a handsome sum to break his word with the Colts. Hold him to it. ■ Do not try to sell me on the Houston Texans. I don’t care if they win their last 13 games. The Texans simply can never beat the Patriots. Bill O’Brien is among the leaders of the “afraid-of Belichick” club, and those letterman jackets will never be forgotten. To the best of my knowledge, J.J. Watt has never made a tackle in a game against the Patriots. ■ Mariano Rivera is a slam-dunk Hall of Famer. Edgar Martinez probably will make the cut this year, in his 10th and final year of eligibility. The late Roy Halladay has a chance in his first year on the ballot. But that’s probably it when the new class is announced in January. Meanwhile, the veterans committee rules on 10 candidates Sunday night, and Steinbrenner is the only old-timer with a chance to be elected. ■ There’s no excuse for the Patriots losing this weekend. The Dolphins are complete frauds, possibly the worst 6-6 team in the history of football. They are 1-5 on the road. They rank 29th in offense and defense. Only eight teams have a worse point differential. Bailed out by the Warhol Division, they are thankful for their three wins against the Bills and Jets. It’s hard to believe Tom Brady is 7-9 in Miami in his career. ■ A story in the Dallas Morning News in October unearthed a 1942 document from the Naval Aviation Cadet Selection Board (penned from 150 Causeway Street in Boston) that listed 21 cadets selected for service. Two of the names: Theodore Samuel Williams and George Herbert Walker Bush. One memo, two legends. ■ I can’t/won’t spend 30 seconds dwelling on the past, present, or future of Urban Meyer. Good riddance. ■ Good luck with the “Roger Goodell Must Go” campaign. The NFL commissioner gleefully takes all the bullets for the buffoonery of his administration, but nothing matters. The commissioner was not threatened by Deflategate and won’t be dented by the mishandling of the Kareem Hunt case. This is the NFL. Only TV ratings matter. ■ Best coach in the history of the Jets? Bill Parcells. He went 29-19 in his three seasons in New York. ■ Jose Canseco’s daughter Josie was one of the Victoria’s Secret models featured on ABC’s lingerie parade last Sunday. ■ Last week I wrote about high school basketball tryouts from the late 1960s, which inspired some great reader feedback. Olympic hockey god Mike Eruzione called to tease me about the reference to cheerleaders’ names from 1968-69. I wondered if there were still any high school girls named Connie, Nancy, and Jeannie. Eruzione told me he has sisters named Connie, Nancy, and Jeannie. All were cheerleaders at Winthrop High School. ■ The best response from the high school basketball old-timers came from reader Stephen Yanofsky, who said he played for Randolph High in 1970 and rode the bench most of the time. ■ Seattle is soliciting names for its new NHL franchise. “Sockeyes” is an early favorite. How about the Seattle Slews? Folks in Seattle have to do better than the leaders in Nashville, who somehow decided in 1997 that the creepy “Predators” was a good idea. ■ The Sox’ front office purge of Larry Lucchino loyalists (anybody seen Dr. Charles Steinberg lately?) is complete. Best wishes to Ken Nigro, recently terminated by the Red Sox after 18 years of service in the public relations department.